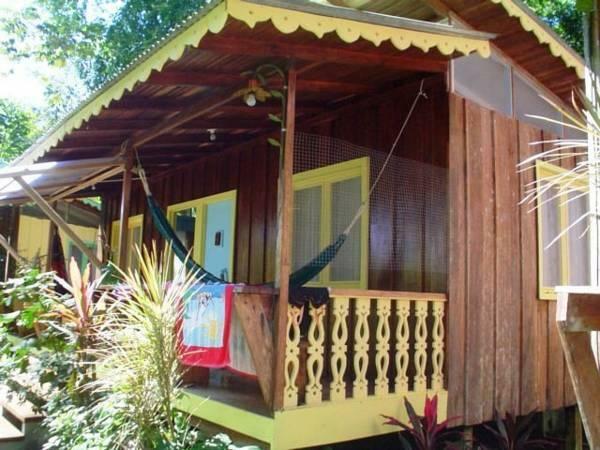 ﻿ Best Price on Playa Chiquita Lodge in Puerto Viejo de Talamanca + Reviews! This attractive, eco-friendly complex of wood lodges is set on Playa Chiquita Beach in Costa Rica’s Gandoca-Manzanillo Nature Reserve. It features pretty tropical gardens, a 1 km stretch of private beach and free Wi-Fi. Playa Chiquita Lodge,’s bright cabins feature artwork from local artists, verandas furnished with hammocks and garden views. They include 2 double beds, ceiling fans, screened windows and a fridge. The private bathrooms have showers with solar panel heaters. A buffet breakfast is served daily at Chiquita Lodge, featuring organic breads and exotic fruits and the Salsa Brava Restaurant serves traditional Caribbean cuisine. The lodge offers a cookery school and organizes excursions, such as cocoa trails and visits to the Cocoa Museum in San Jose. The hotel is located 5 km south of Puerto Viejo. It is 4.5 hours' drive from Juan Santamaria International Airport. Please note that only cash is accepted. Please inform Sunrise Beach Hotel in advance of your expected arrival time. You can use the Special Requests box when booking, or contact the property directly with the contact details provided in your confirmation. Schon bei der Ankunft fühlte sich keiner für uns verantwortlich. Der stark betrunkene Besitzer Schrie eine Frau mit "Shut up" an. Ein anderer Gast brachte uns schließlich in unsere Lodge. Diese ist in die Jahre gekommen und sauber gemacht wird anscheinend nie. Das Ergebnis sind Flöhe im Bett. Da hört der Spaß auf! Das Personal ist unfreundlich. Man wird ignoriert und fühlt sich als Störenfried. Die Lage ist die nächste Katastrophe. Man kann nur mit dem Taxi die nächst größeren Orte erreichen. Das bedeutet pro Fahrt allerdings ca 6 Euro. In keinem Punkt zu empfehlen!